Who knew goblins were soooo…. *raises eyebrows*. Tee hee!!! Certainly not I! 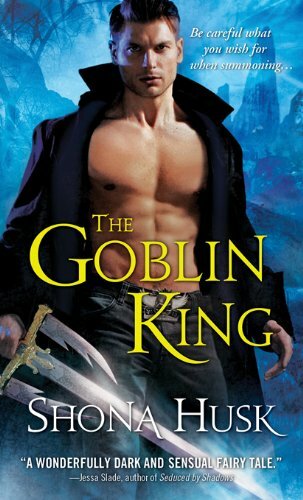 Unless… he’s not the goblin in this one? The Goblin King: Cursed by a Druid millennia ago, Roan lives a bleak existence in the Shadowlands, desperately trying to retain his soul and not succumb to the goblin horde. When a beautiful human summons him to grant a wish, he sees a glimmer of hope. But will she ever agree to be his queen? I do like the cover. I downloaded the free prequel: The Summons. I liked it enough to get The Goblin King. It was really good. Rebecca! Good to know that it’s good 🙂 So like… is Paul the Goblin?? If I was 22 I’d make a poster of all of his book covers. I’d do it now if I didn’t have a husband whose feelings would suffer. I will have to check out the reviews on Amazon on this book. Has Paul ever been on the cover of a bad book? Danna…It is *quite* the sword though, right. All nice and shiny ‘n stuff. You can all THANK ME later. Enjoy the show and try not to drool on your keyboards. Tina. Thank. You. Just. Thank you.